People in relationships get lonely, too. If someone is no longer able to participate in a meaningful relationship with their partner because of a personal injury or wrongful death, that partner can get legal recovery. Find out what’s included in a loss of consortium claim, how to prove it, and what to do if you have a case. Loss of consortium. If you’ve heard the term, it might be as a punchline or hypothetical, but it’s a real cause of action in a personal injury lawsuit. Most people’s perception of loss of consortium is that it’s just about a spouse whose injury results in an inability to have sexual relations. Yes, that’s part of it. But the legal definition includes other relationships, too — loss of care and affection are part of consortium and it’s not limited to the marital sexual relationship. What’s included in a loss of consortium claim? Most loss of consortium cases are based on the loss of a legal spouse, but some states allow claims for committed partners, and even parents and children. Loss of consortium is always within a personal injury case. If you’re injured by the negligence or a wrongful act of another person or legal entity (for example, a manufacturer or property owner), you can file a personal injury lawsuit. A personal injury lawsuit is filed so that the injured person (plaintiff) can receive money as compensation for medical treatment, lost wages, therapies or rehabilitation, and other expenses related to their financial losses from the injury. The purpose is for the injured person to be made whole — in other words, restored to the condition you were in prior to the accident. A loss of consortium claim is typically filed by the spouse or partner of the person who was killed or injured. As we know, money pays for lots of things that make our lives easier, but it can’t replace love and affection. 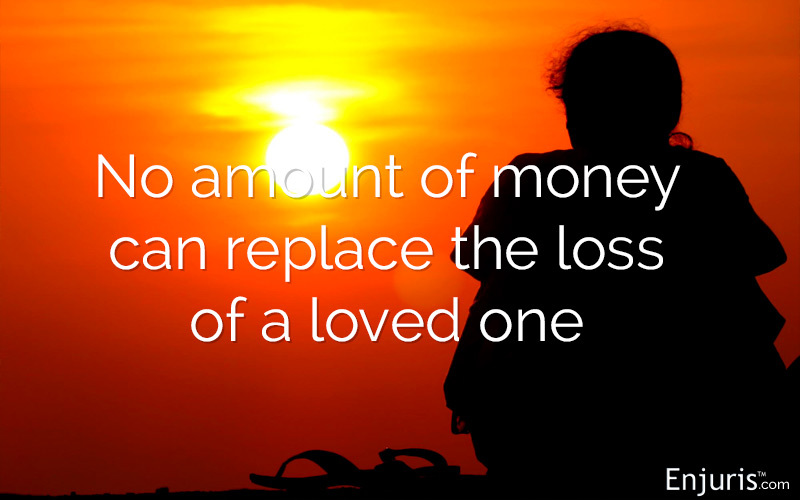 Still, the courts make it possible to provide some financial compensation based on these intangible losses. When a loss of consortium claim is filed by a surviving child or parent, it’s called “filial consortium.” Filial consortium damages are for lost love, care, and companionship that come with losing a child to death or irrevocable injury. Most states only allow filial consortium damages if the child has died. However, there are a few states that do provide for loss of consortium for a child who is severely injured. Such states include Massachusetts, Florida, and Arizona, among others. Enjuris tip: A loss of consortium claim can be filed by a spouse, parent, or child if the injured or deceased person is no longer able to provide love, affection, companionship, parenting, care, or continue a sexual relationship. It’s hard to place a dollar value on loss of consortium because it’s a non-economic damage, which means that money can’t replace what’s actually been lost. It’s similar to damages awarded for physical pain and suffering or emotional distress, which are equally difficult to quantify. A loss of consortium claim can only be for the most severe injuries — for example wrongful death, paralysis, amputation, or incontinence. These injuries need to be long-lasting or permanent to result in a loss of consortium. “The joy of life - what makes it really worth living - is not the earning of money to pay to others for life’s necessities. When a person is seriously injured, the greatest loss is the loss of the enjoyment of life, the pleasure, the satisfaction or the utility that human beings derive from life, separate and apart from earnings. These are non-economic injuries. What is truly valuable to us as human beings is our ability to live life on a daily basis free of any debilitating physical or emotional problems that diminish our capacity to enjoy life and compromise our sense of self-worth, dignity, and integrity. Was it a loving and stable marriage? If a spouse is injured in a car accident, for example, and the physical injuries make them unable to provide love, affection, companionship, and a sexual relationship to the other spouse — in addition to household maintenance and chores, responsibilities of raising children, and other lifestyle activities — the non-injured spouse could claim damages for those losses. The plaintiffs (the injured person and partner) were in a committed cohabitating relationship both before the accident and after. The injury or death was caused by the defendant’s negligence or wrongful acts. Because of the defendant’s wrongful acts, the partner of the injured person has suffered and will continue to suffer loss of society, affection, assistance, and sexual relations and that this will be detrimental to their ongoing relationship or life. Villaseca v. City of New York, 2008. The plaintiff, a teacher, was injured when a student slammed a school door into the side of the teacher’s head. It was determined that the Board of Education was liable because it hadn’t met the standards for inspection and maintenance of the door. The teacher had nine surgeries and experienced a loss of vision. The teacher was awarded $5 million for pain and suffering. His wife was awarded $750,000 for loss of consortium because she had to assume responsibility for household chores, cooking, taking care of their child, and helping her husband in his daily activities. Bissell v. Town of Amherst, 2012. The plaintiff became paraplegic as a result of a work-related accident. He received workers’ compensation for treatment of his physical injuries and lost wages. The injuries left him paralyzed, incontinent, and sexually dysfunctional. His wife took over his medical and hygienic care and was awarded $1 million for loss of consortium. A claim for loss of consortium is usually included as part of a personal injury lawsuit. Your lawyer will first need to establish the defendant’s fault, determine medical expenses and other costs, and the other elements present in a personal injury case. A personal injury lawyer can advise you on whether you have a claim for loss of consortium, how it will be presented, and what outcomes are possible. Start by using the Enjuris Law Firm Directory to find a lawyer near you who understands the ins and outs of the process and can get you the compensation you deserve.